MU is the only Missouri institution to award the doctor of veterinary medicine degree (DVM), graduating approximately 115 new veterinarians each year. 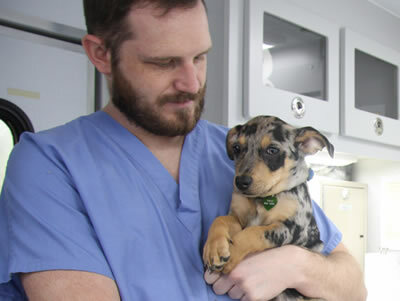 The University of Missouri’s professional program leading to a DVM boasts a unique curricular structure, which provides nearly two years of hands-on training in the college’s general and specialty clinics. Years one and two focus on instruction in high-tech, computer-based classrooms and labs. Clinical training in the Veterinary Health Center hospitals and the Veterinary Medical Diagnostic Laboratory consists of service rotations that range from two to eight weeks in length. Students must complete the following core rotations: equine medicine and surgery, food animal medicine and surgery, anesthesiology, radiology, neurology and neurosurgery, oncology, ophthalmology, small animal orthopedic surgery, small animal soft tissue surgery, diagnostic pathology, small animal community practice, small animal internal medicine, small animal emergency and critical care, and theriogenology. The DVM professional curriculum is integrated with MU veterinary services, including statewide animal disease diagnostic services, and extension and continuing education programs for animal owners and veterinarians. The North American Veterinary Licensing Examination Council on Education requires a minimum pass rate of 80 percent on the licensing examination to maintain full accreditation. Since 2010, University of Missouri College of Veterinary Medicine graduates have had a pass rate of 97 percent or better. Each year, the Veterinary Health Center cares for about 17,000 hospitalized animals and thousands more on farms. Many of these animals come from the Columbia area for primary care and emergency care, while others are referred by veterinarians throughout the Midwest for the College’s specialized clinical services. Specialized clinics within the Veterinary Health Center include small animal, food animal and equine. The College’s location between two metro areas – St. Louis and Kansas City – and adjacent rural areas offers a strong caseload in companion, equine and food animal species, as well as opportunities for collaborative research, instruction and pursuing externships. The MU College of Veterinary Medicine is home to one of the oldest, largest and most respected laboratory animal medicine residency/comparative medicine research training programs in the country. It has been continuously funded by competitive National Institutes of Health grants for more than 40 years. The Research Center for Human-Animal Interaction (ReCHAI), a collaboration between the College of Veterinary Medicine and Sinclair School of Nursing, is on the leading edge of programs and studies focused on the benefits of human-animal interaction. Collaborative efforts between MU researchers in veterinary medicine and human medicine have helped create new pharmaceuticals and medical techniques, including Quadramet, a radiopharmaceutical that relieves the pain of bone cancer. The College of Veterinary Medicine is an acknowledged partner in MU’s life sciences research efforts, providing graduate students significant research opportunities across many disciplines. MU established the first vaccine-virus laboratory in the United States, in 1885. MU is a leader in equine lameness research and veterinary oncology research. MU veterinary medicine extension specialists, through herd health management consultation and medical care, are directly responsible for increasing the efficiency of Missouri’s food animal production. The Veterinary Medical Diagnostic Laboratory is the only nationally accredited diagnostic laboratory in Missouri and one of only five in the Midwest, serving veterinarians, conservationists, scientists and researchers. The lab handles more than 40,000 diagnostic tests annually to help determine the cause of death and disease in animals. Mizzou is one of only five universities nationwide with law, medicine, veterinary medicine and a nuclear research reactor on one campus – and one of a handful of public universities with veterinary medicine, nursing, medicine, agriculture, animal science, nuclear research, and health professions on the same campus. MU is one of only 34 public U.S. institutions in the prestigious Association of American Universities, whose members are top-tier schools noted for outstanding teaching and research endeavors. MU is home to the largest United States’ producer of radioisotopes for diagnosing and treating cancer. MU’s National Swine Resource and Research Center is the country’s only repository and distribution for swine models. MU also houses the only Rat Resource and Research Center and one of three Mouse Resource and Research Centers in the United States. College of Veterinary Medicine faculty and graduate students are among the more than 1,000 life scientists at Bond Life Sciences Center who are working to improve human and animal health, food and the environment. The MU Life Science Business Incubator helps launch startup companies, many of which grow from student and faculty discoveries. Among the companies is Equinosis, which makes and markets the Lameness Locator, an advanced system for diagnosing lameness in horses. Veterinary medicine researchers have access to the International Institute for Nano and Molecular Medicine, a campuswide research center dedicated to the discovery and application of fundamental and translational medical science based upon previously unexplored chemistry combined with nanotechnology and the biosciences. The College of Veterinary Medicine has access to the Low-Level Radiation Laboratory, located within the College of Agriculture, Food and Natural Resources. This low-level, whole-body radiation counter measures natural and induced radioactivity. At the MU Dalton Cardiovascular Research Center, veterinary medicine scientists join those from such fields as biochemistry, biological engineering, electrical engineering, and medicine, physiology to apply their particular expertise to health problems like hypertension, cancer, cystic fibrosis and heart disease. Veterinary medicine scientists work within MU Laboratory for Infectious Disease Research, part of our nation’s bio-defense effort. This $16.5 million facility aids researchers in fighting pathogens such as West Nile virus. It includes research laboratories and associated research-support areas, and is one of only 13 such structures in the United States. College of Veterinary Medicine faculty conduct radiobiological experiments at the Nuclear Reactor Research Facility, the largest university-based research nuclear reactor in the nation. MU and its biochemistry researchers, including those in the College of Veterinary Medicine, have a $2.3 million high-powered nuclear magnetic resonance spectrometer (NMR), only the second of its generation in the United States and the only one in Missouri. Scientists use the NMR to see molecules in three dimensions and view their interactions. Understanding these interactions is crucial to understanding health and disease. The College has more than 4,000 alumni living throughout the world and working in a variety of disciplines. Their accomplishments range from pioneering an artificial insemination technique to save the endangered African elephant to founding the largest pet insurance company in the nation. In the past 20 years, four of the presidents of the American Veterinary Medical Association, which represents approximately 88,000 veterinarians, were MU College of Veterinary Medicine graduates. Consumer surveys consistently rank veterinarians among the most respected professionals in America. Currently, there are more than 95,000 veterinarians in the United States and the profession is growing annually. In the United States, approximately two-thirds of veterinarians choose to work in private or corporate clinical practice. Others join state and federal health agencies, military service, biological and pharmaceutical companies, and academic institutions. Large-animal veterinarians are increasingly becoming an important resource for agri-business, helping companies with herd health and productivity issues. Veterinarians are a valued part of defending the nation against terrorist attacks in their roles of diagnosticians and homeland security administrators.